Partizan NIS have defeated Budućnost VOLI in packed Aleksandar Nikolić Hall. The Belgrade squad now have a better head to head score vs. Podgorica side. Game recap: Huge night for Partizan NIS! The black & whites have defeated the reigning ABA League champions Budućnost VOLI in packed Aleksandar Nikolić Hall. The 9-point margin came up as a sweet bonus for the Belgrade team, as they now have a better head to head score against Podgorica side. What is also important to mention is that Partizan NIS have qualified for the 2019 ABA Playoffs after this match. Key moments: Partizan NIS gained the crucial lead in the 3rd quarter when they escaped to a 9-point lead. In the last 10 minutes the black & white defense did their job as the home team have successfully kept the lead until the end. Man of the match: There is absolutely no doubt who's getting the MVP award this evening. 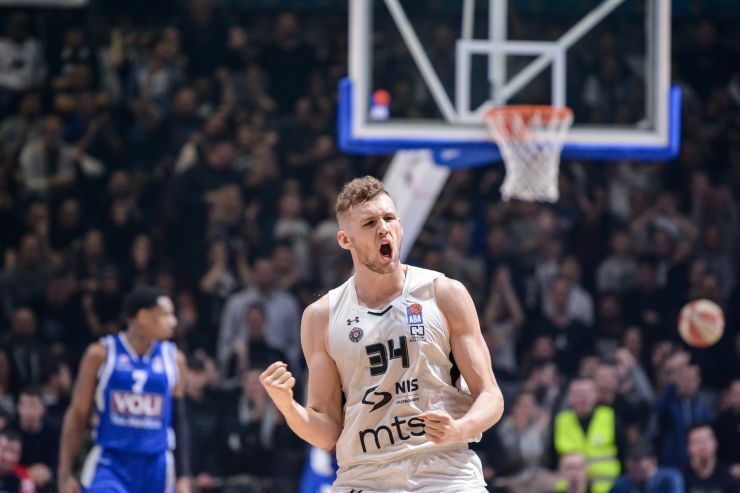 Jock Landale was once again leading Partizan NIS toward the win, while this time he finished the match with 23 points. He was far the best scorer in the winning team. Can't trick the stats: Apart from huge desire that Partizan NIS squad showed in this match, the black & whites also played more as a team than their opponents. And the stats sheet proves that. Partizan NIS had 25 assists, while Budućnost VOLI had 16.